Located outside Funchal with 317 bedrooms and suites with 2 restaurants and 2 bars - with 3 pools (one heated indoor) - Spa & Fitness plus supervised Kids Club. An ideal location for families. Discount rates online. The Tivoli Hotel Madeira Resort & Spa is located on the beach front of Praia Formosa just 3 kilometres outside the town of Funchal on Madeira Island. The Hotel has 245 Standard Rooms, 21 Superior Rooms, 23 Terrace Rooms and 24 Tower Suites. They are well furnished with air-conditioning, mini-bar, satellite TV, safe, Internet and most with a balcony with great sea views. The Hotel has a direct access to the Formosa beach by a walkway. A courtesy bus takes guests daily to the town of Funchal for shopping and its many bars and restaurants. Within the Hotel there is equipment and eight facilities for conferences for up to 756 delegates. There is Internet and parking on site. The Hotel facilities include an an indoor heated pool. an outdoor pool with a pool for children. A Spa and Fitness Centre with a gym, sauna, steam, massage, and treatments and massage. There are two restaurants, the 'Boca do Cais' and the 'Panoramico' that provide a good selection of Mediterranean and Portuguese cuisine for both lunch and dinner. There are two pleasant bars for guests in which to relax over a social drink. 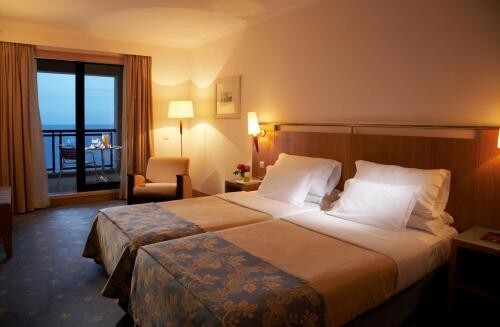 This spacious and air-conditioned room features a furnished balcony or a terrace with partial sea views. It comes with a seating area with flat-screen cable TV and a minibar. The bathroom has a bathrobe, toiletries and a hairdryer. A luxurious room with extra long beds and a furnished upper-floor balcony or ground-floor terrace with side view of ocean. Has a separate living room and a furnished upper-floor balcony with panoramic Atlantic Ocean view as a well as a small second balcony. Featuring 2 adjoining rooms, a furnished balcony overlooking the sea or the pool.